Packaging and shipping foam from Soundproof Cow isn’t as much a sound absorption material as it is about protecting fragile cargo. Achieve the peace of mind you deserve when shipping thing and send it protected with a variety of packaging and shipping foams including static-free foam as well. Packaging and shipping foams are great for: reducing movement during shipping protecting packaged items preventing crushing when moving. 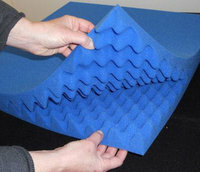 Soundproof Cow is the only source for foam packing supplies that you will ever need. At Soundproof Cow we offer two main types of packing foams to cover the requirements of all of our customers. We have three kinds of packing foam sheets for standard shipping needs. The first is your basic flat packaging foam. This is a simple, non-convoluted, affordable foam that provides lightweight protection and is great for protecting some of your more delicate items for shipping or storage. It comes in 3x2x4 and 1x2x4 sizes. If you need extra protection, we also offer a variety of polyethylene foams. These foams provide extra cushioning as well as volume when shipping and storing. They also make great container liners for fragile and impact-sensitive items. Available in 3x2x4, 2x2x4, 4x2x4 and 1x2x4sizes. Finally, there is our egg crate convoluted packing foam, which is a lot more effective than actual egg cartons when it comes to protecting your valued items. The egg crate design means more surface area in the packing foam sheet, which means more cushioning and a stronger ability to restrict motion of the wrapped items, which is great for shipping purposes. Available in 3x2x6, 5x2x4, 3x2x4 and 1.5x2x6 sheets. 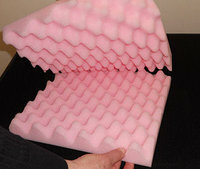 If you have items you need protecting, get your Soundproof Cow shipping foam now! If you have extremely sensitive items to ship and you need a premier product, you can order our Ezeeshipr Anti-Static Shipping Foam today. This product is made from a pink anti-static polyethylene foam that is specially designed for the transportation of fragile or hazardous items where electrostatic discharge is a concern, such as shipping electronics. Available in 1.7 lb. or 2.2 lb. densities in one-inch or two-inch thicknesses. In the digital age, packing and shipping are crucial parts of almost any industry. Online sales are rapidly making up the bulk of many companies’ profits and online sales mean postal delivery of products. That means your shipping materials must be first-rate. Cutting corners when it comes to foam packing supplies can mean broken items and unhappy customers, which can be very bad for business. 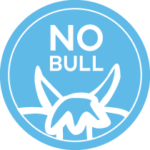 While Soundproof Cow is most famous for our top-of-the-line soundproofing products, we are also well-known for the quality of our foams. You can be very confident that these packing foams will do the job that you purchase them to do. Don’t ship your items without the proper protection. To order your foam packing supplies, or for any questions regarding our products, contact Soundproof Cow today.